four × 8 = Required Please enter the correct value. Silver may not be as scarce as gold, but its attractiveness to investors has been gaining momentum in 2016. Many are asking why are silver prices rising, and the answer is twofold. Silver prices are up after several years of declines due to a host of economic factors combined with a surge in demand for the product. Here is a more in-depth discussion of those elements that answers the question: "why are silver prices rising?" Weakened U.S. Dollar – The U.S. dollar continues to be weak in 2016, and this is good news for investors who are digging into the mystery of why silver prices are rising. It's not that mysterious because the price of silver has an inverse relationship with the dollar. Investors generally shun precious metals when the dollar is strong, so a weakened dollar remains a positive signal for rising silver prices. Interest Rates – Silver prices have a strong relationship with movements in interest rates. 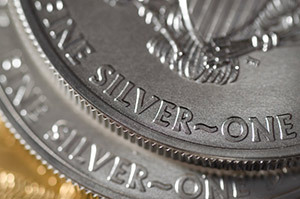 In fact, the price of silver took a short-term hit at the end of April, when the Federal Open Market Committee meeting took place to discuss a potential interest rate hike. Even though no increase in interest rates occurred, just the possibility was enough to send silver prices for a brief tumble. Regardless, the price of silver was up 15% for the month and has surged more than 20% so far in 2016. Silver prices have a reverse relationship with interest rates, yet the recent remarks of the Fed are encouraging. Also, even if there are some short-term pullbacks in the market for silver, Money Morning Resource Specialist Peter Krauth believes that the long-term prospects for silver are positive because of the gold/silver ratio. Gold/Silver Ratio – When former President Richard Nixon ended the conversion of U.S. dollars into gold by foreign governments in 1971, there was a change in the way that precious metals were valued. From this point forward, gold and silver prices became more correlated than in the past, making the gold/silver ratio a valuable pricing indicator. This ratio is essentially the price of silver relative to the price of gold and can be an indicator of when to invest in silver. When the ratio shoots up past 80, which is a rarity, this is a strong signal to investors that silver is severely undervalued. Periods of higher than average gold/silver ratios, as we've seen this year, are excellent signs for investors that the price of silver is going to continue to rise. Supply of Silver – When the supply of anything tightens, prices will rise, and that is exactly what is happening with silver this year. In 2016, mine production of silver is falling. In Canada alone, silver mine production has declined 13% year over year. Mexico is the world's largest producer of silver, and its production of silver dropped 10% in the first month of the year alone. As supplies dwindle, people's appetite for the product continues to grow, which is great news for silver prices. Demand for Silver – The demand for silver is one of the driving factors that answers the question "why are silver prices rising?" Not only is silver a popular safe-haven investment and a hedge against economic uncertainty, but it is also in demand for ornamental and industrial purposes as well. Silver jewelry has seen a resurgence in popularity in the past several years, and this growth is expected to continue. Silver is also used in such things as batteries, medical technologies, windows and glass, nanotechnology, and electronics. One of its growing applications is in photovoltaics for solar energy, where a single solar cell employs two-thirds of an ounce of silver. Silver Coins and Bullion – Purchasing physical silver is the most traditional and direct way of silver investing. Silver American Eagle coins are the most popular silver coin investment. The coins generally come in 1-oz sizes, are 0.999 pure, and are selling in record numbers in 2016. Another choice is the Canadian Silver Maple Leaf, which is 0.9999 pure silver. Silver bars are available in a variety of sizes and will likely get you the most silver for your money. When investing in physical silver, avoid anything that is ornamental or collectible and be sure to consider additional charges such as premiums, shipping, and storage that could cut into your potential profits. Silver Pooled Accounts and Certificates – If you would prefer not to own physical silver, certificates and pooled accounts are an option. Some require a minimum investment, and you will pay a small fee for administration. Silver Futures Contracts – Futures contracts are an excellent way to gain leverage on precious metal price changes, but they can also be risky. If you have experience with futures contracts, you can incorporate this into your silver investment strategy. Silver ETFs – Silver exchange-traded funds (ETFs) are another popular option for investors who would rather not store stacks of silver in a home safe. The iShares Silver Trust ETF (NYSE Arca: SLV) is the most popular silver ETF. The fund holds approximately $6 billion in physical silver in two vaults and has seen returns of 24.41% year to date. Another popular ETF is the Sprott Physical Silver Trust ETV (NYSE Arca: PSLV). This one is also backed by stores of physical silver that are held in Canadian vaults. The returns on PSLV year to date are 25.62%. Why are silver prices rising? A combination of economic factors, contracting supply, and surging demand are producing some of the best conditions for silver investors in years. As any precious metal investing is speculative in nature, be sure to keep a reasonable level of diversification in your overall portfolio when investing and reevaluate your positions at least annually. To learn more about investing in silver, check out this free analysis: The Essential Guide to Buying Gold & Silver. The reason for the drop was due too manipulation by JP Morgan increasing the supply of silver by paper fraud and not real physical silver.